Nyingmapa Wishfulfilling Center for Study and Practice aka Pal Ngagyur Shedrup Döjö Ling is a community of ordained and lay practitioners of the Nyingma lineage, founded by Khetsun Sangpo Rinpoche in 1974 first in India, and later relocated to Nepal at the initiative of Dudjom Rinpoche. It was the first Dudjom Tersar institute founded outside of Tibet. 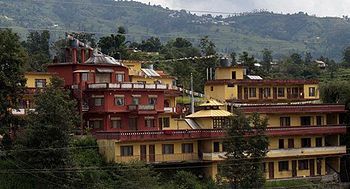 In 1974, the Nyingmapa Wishfulfilling Center for Study and Practice was created by Khetsun Sangpo Rinpoche, in Dalhousie, Himachel Pradesh, India, near Dharamsala, the seat of the Dalai Lama. In 1975, the center moved from Dalhousie to Mussoorie, Uttar Pradesh (now Uttar Khant). In 1977, at the behest of Dudjom Rinpoche, the center was relocated to Nepal, in Boudhanath, Kathmandu. In 1995, the present monastery and the school in Sundarijal was constructed. The center currently houses more than 50 monks and several ngakpas under the leadership of Khetsun Sangpo Rinpoche’s grandson and dharma heir, Tulku Jigme Norbu Rinpoche. The Nyingmapa Wishfulfilling Center for Study and Practice resides now on the north-eastern edge of the Kathmandu Valley, Nepal. The monks and ngakpas are gathered from a vast area reaching from southern India through Sikkim to the remote Mugum Valley of north-western Nepal, and into the Indian state of Himachel Pradesh, including the regions of Kinnaur and Spiti. This page was last edited on 1 June 2014, at 07:08.